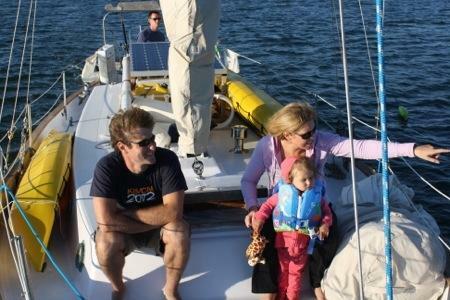 It was a beautiful morning in Rockland and our friends, Darren, Katie, & Annika were just arriving for a weekend visit. We were very excited to see familiar faces! Everyone needed to stretch their legs after the long car ride so we took to the streets to see what downtown had to offer. We found beautiful galleries, handcrafted gifts and jewelry, and an assortment of restaurants. The local talent was abundant and throughout town were posters and flyers announcing all sorts of artsy and musical events. Darren sought local recommendations for a good lunch spot. We decided to try the Brass Compass Cafe, recommended for it’s fresh, local seafood. Superb! We chowed down on fried clams, crab cakes, and…dun da da…the King of Clubs lobster club sandwich. Our server was friendly and enthusiastic, he made us feel right at home. With our bellies full we made our way toward Rode Trip via the grocery store. Annika shouted out a “Yay!” when we arrived at Hannaford. Thank goodness someone enjoys grocery shopping! Brian and I were thrilled to access the store by car. We stocked up on necessities and still had space in the cooler once all the beer was stowed. PHEW! Rode Trip was anchored near a public boat ramp and fortunately the parking lot allowed overnight parking. 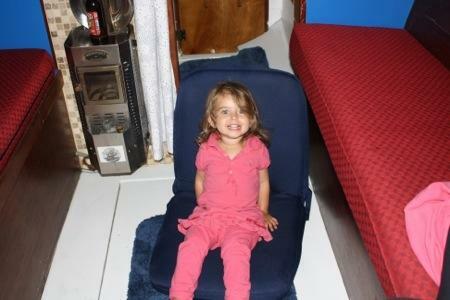 We made two dinghy trips to the boat, one for groceries and one for guests. Annika showed off her new dolphin life jacket. Super cute! Everyone settled in quickly at Rode Trip. 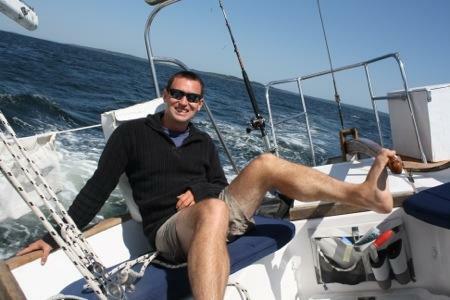 Darren helped to haul the anchor and we headed out of Rockland Harbor bound for the Fox Island Thorofare. The sun was shining and the wind was steady. 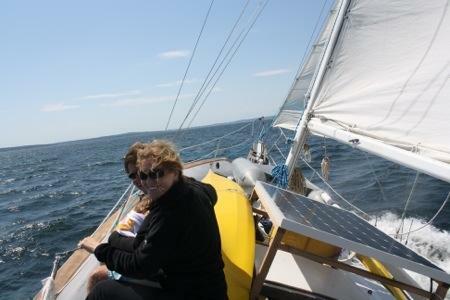 We had a comfortable downwind sail across the bay and all the way through the thorofare. Smooth sailing! 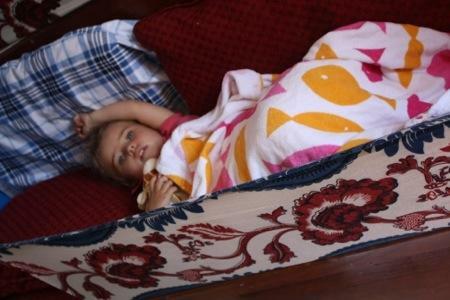 Rode Trip’s starboard bunk was a cozy spot for napping once the lee cloth was in place. Up on deck, we kicked back and enjoyed views and brews along the way. 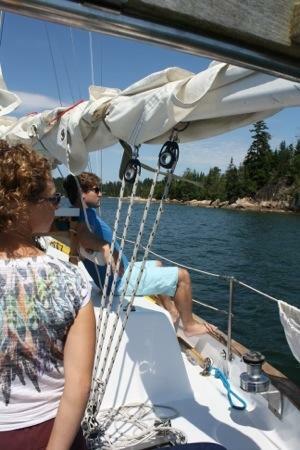 We anchored in Seal Cove. 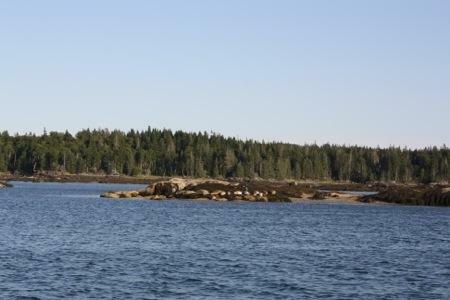 What a treat that the seals greeted us on our way into the cove! We spotted several seals sunbathing on the rocks. 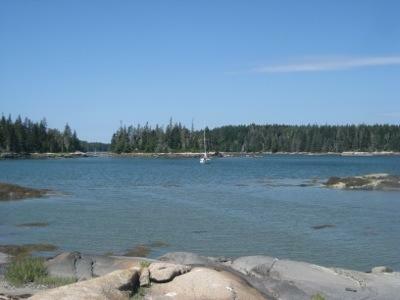 Seal Cove provided a very protected anchorage tucked away from the wind and sea. We had some neighboring sail and powerboats also enjoying Seal Cove. 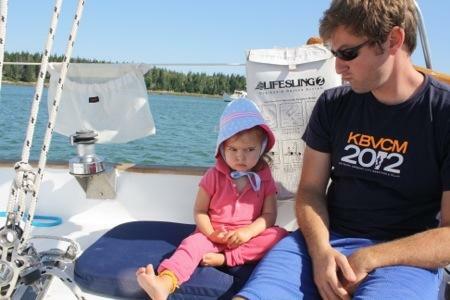 Rode Trip hardly moved, Katie noted that she had to remind herself she was on a boat. 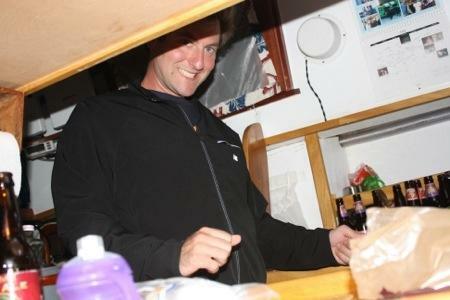 Brian and Darren stayed topside to fish while the ladies prepared dinner. Annika helped to pump the water to boil the noodles, get out the dishes, and grate the cheese…but then she and Aunt Stephie nearly ate all of the cheese so we had to step away from the kitchen while dinner cooked. We had a lovely pasta dinner on the deck. The boys didn’t have any luck fishing. The mackerel and squid must have known they were serious about a fish fry and so stayed away. After dinner we lounged and chatted in the cabin to avoid the bugs topside. Darren made dessert. 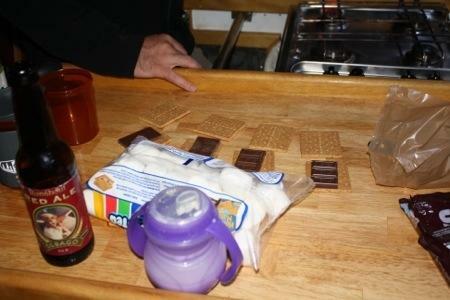 Smores! MMMM! 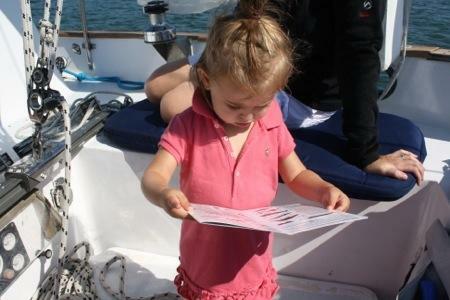 Annika, having had a wonderful start to her sailing trip, was very interested in becoming a member of the crew. She fancied the anklet I wear. I pointed out Brian’s as well and we offered to make her one of her own. 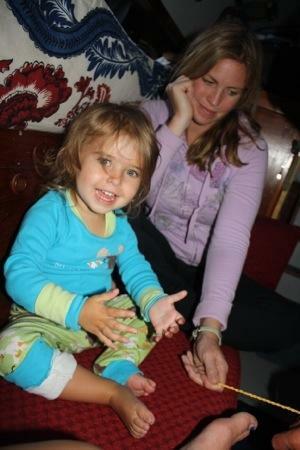 Brian remembered the four strand sennet knot in a hurry and made Anni a custom, crew member’s anklet. She was so excited that she wanted Mommy and Daddy to have anklets too! I guess living off the grid doesn’t mean we’ve lost our style sense! Little do they know…they may now be pressed into service at any time aboard Rode Trip. On Sunday morning Brian and I awoke to quite an unfamiliar sound…”mommy, mommy, mommy…” was this some new wildlife we hadn’t yet encountered? Everyone slowly woke after a peaceful night’s sleep and some early morning snoozing. I started coffee brewing as it seemed that the captain isn’t the only person who needs a little eye opener. Katie tried out the fishing pole, still no bites, and Brian made breakfast. We enjoyed pancakes and eggs on deck. 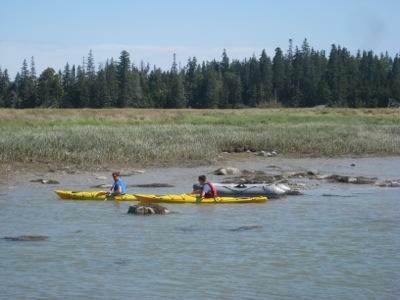 Then, after a quick lesson in marine biology, we got dressed and headed ashore for some uncharted exploration! 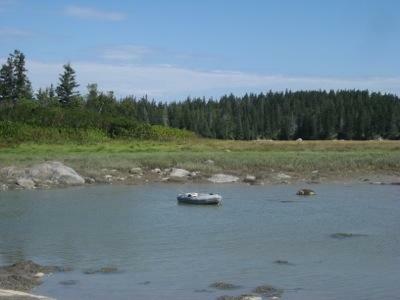 We beached the dinghy and kayaks on a very muddy, rocky island. 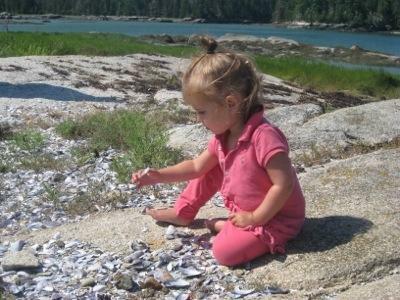 We found mussel shells, snails, baby fishes, some pretty flowers, and MUD! We also avoided a patch of poison ivy. Then just as our exploration was ending, the dingy took a stroll to see the other side of the island. Brian and Darren to the rescue! Fortunately, the wind was in our favor so the dinghy didn’t get too far away. 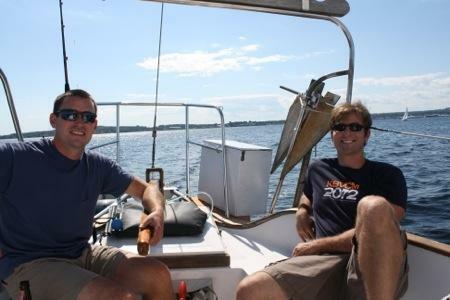 Brian and Darren swung the dinghy back around and gave Katie, Annika, and me a tow back to Rode Trip. Brian and Darren took their ceremonial “dip” into the down east waters before we departed Seal Cove. 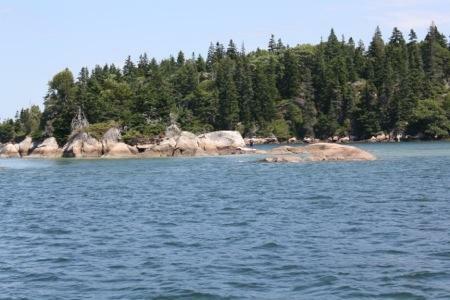 We motored out of the cove and back through Fox Island Thorofare. It was a very windy day! Once out of the thorofare we set sail and everybody held on tight for a fast, heeled over, upwind back to Rockland Harbor. Captain and crew did a fine job and once back on land we all headed to the ice cream shop to celebrate our fabulous weekend!